ELECTRIC STEAM GENERATORS SPECIALLY DESIGNED TO SUPPLY STEAM STERILIZERS IN HOSPITALS, LABORATORIES AND RESEARCH CENTERS. Some of its most outstanding features are: ease of use, high steam production capacity, easy installation, and automatic operation. 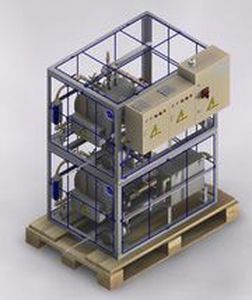 Steam production from 40 to 164 kg/h of steam. Body in stainless steel EN 1.4404 (AISI-316). CE marking on pressure vessels.